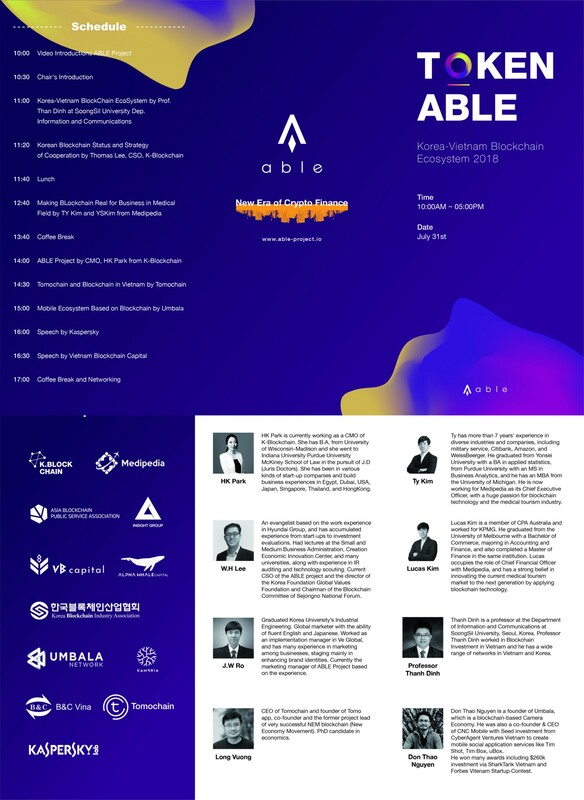 ABLE will host the 2018 TOKEN ABLE Conference in Ho Chi Minh City, Vietnam on July 31st. Since its MOU with KAMBRIA and Alpha Whale in early July, we have continued to share ABLE’s vision with Southeast Asia and strengthen partnerships with various partners. Crypto Ventures like Vietnam Block Chain Capital, Alpha Weil Capital, Vietnam Blockchain Companies like TomoChain, Umbala, Korean Blockchain Companies like Medipedia, ABLE have participated as key speakers to discuss the innovations and trends of blockchain technology and their project visions in Vietnam. It will be a significant opportunity to share with Vietnamese blockchain investors. After the conference, we plan to finalize the investment in Vietnam and will announce it as soon as it is confirmed. Additional deal with global institutional investors and strategic investors are also in the final stages and we expect to be able to share them in early August.